Our digital camera is not working (and hasn't for about a month) so I've hesitated to write lately. The two ideas for blogging have required photos to make the best impact but the blog is getting seriously outdated so I'm going to write now, adding stock photos I found online to give you an idea of what I'm describing. 1. Three Dresser Drawer for Colby's Room. $10. I promise, the one I bought is not nearly as pretty and needs a new coat of paint and some decoupage-ing. 2. 8 cans of baby formula from a local mom. At $5 per can (normally $11-12 at Wal-Mart), we fed Colby for half-price last month. I'll admit, this was the sketchiest purchase but the mom was totally normal and had a 13-month old who had transitioned to milk. 3. Double Jogger. I've been wanting to get out and walk (maybe run, ha) with the kids so I've been dreaming about a double jogger, where the kids sit side-by-side. Found it. Burleson for $40. This is a STEAL, for anyone who tracts these. Now, please keep in mind that ours is USED, slightly faded and the brake doesn't work. 4. We sold our dining room table & chairs for $225 to a guy who lives in north Dallas. He picked up and hauled away the first piece of furniture the Thompsons bought four years ago. 5. Two-drawer filing cabinets for $5 each! They are rusted but work great so with a can of metal primer & aqua blue spray paint, I'll have a very shabby-chic home filing system! 6. 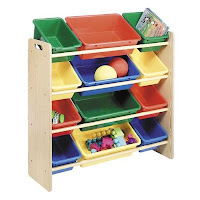 This week, I came across a 12-bin toy organizer shelf thingy. The bins on ours are light blue, dark blue, green, and red so it's perfect for Colby's room or maybe the playroom. We'll see! 1. eBay shipping, auctioning, etc. 3. The whole consumer-driven economy of mass-produced everything! 1. Driving sometimes long distances. 2. The risk of seeing it in person but not liking it (hasn't happened yet). 3. Finding something online that's already been sold. I'm a JUNKIE and I'm LOVING it! I love that you are finding stuff on CL. IT's like you're redeeming old stuff and making it new. So cool. Heck yes! I used to be a part of Freecycle in Abilene. It's like Craigslist, but better (in a way), because everything is free! The DFW chapter isn't as good in my opinion, because there's too many people wanting, and not enough giving, but Abilene's was amazing. I got to bless a lady who had 5 kids with 5 boxes of laundry detergent that ACU was just going to throw away. And I ended up getting a skateboard and lots of month old magazines to read during the summer. Junk is amazing!! !